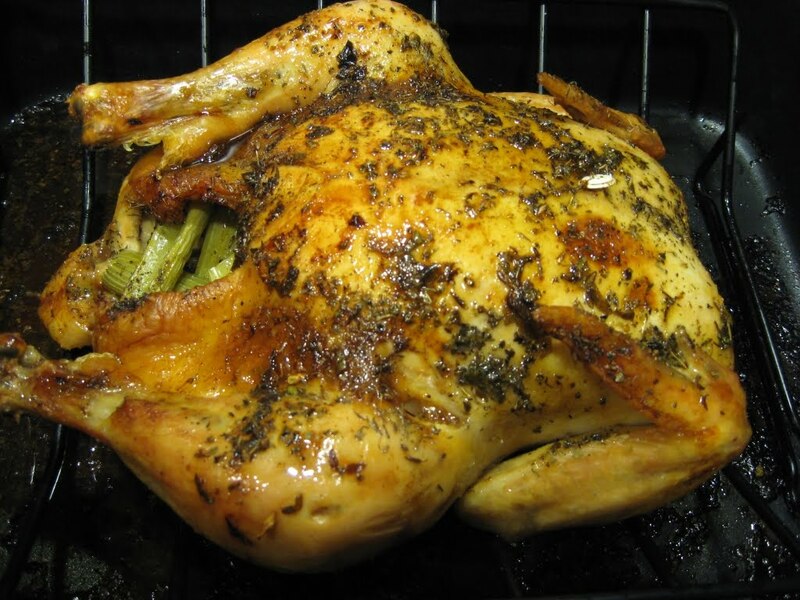 I decided to make a roast chicken this weekend in preparation for the Thanksgiving dinner I’m hosting next weekend for the in-laws. I had a recipe from my good friend Tasha, but I ended up going with a variation on my Mom’s usual way instead. I’ll get to yours soon, Tasha! I promise! First of all it was a much bigger chicken than the recipe called for. Almost twice the weight. So it took much longer to cook, leaving us with an extremely late dinner. Luckily I tried this on the weekend, so it wasn’t too bad. Had I tried this after work, we’d have been eating around 1am! I took the guts out of the chicken and rinsed it off and patted it dry. I snipped off some sprigs from my thyme, sage and oregano plants in the sunroom, minced them, and then stirred them into a small bowl (a little over 1/4 cup) of olive oil with some salt and fresh pepper. I’d say it approximated a tablespoon of each spice, so it looked like oiled herbs instead of herbed oil. I cut 3 ribs of celery into inch-long pieces, and a large onion into rough wedges. Those went into the cavity along with the juice from one squeezed lemon. I used a trick I got from Rachael Ray and microwaved the lemon for a few seconds before squee zing it, and it helped get a lot more juice out of it. Then I rubbed the oily mixture all over the outside of the chicken and stuck it in the oven at 350 for what seemed like forever. It was a nearly 8 pound chicken, and it took about two and a half hours. I kept checking it with the meat thermometer and it just never got to the right temperature, so I just left it there until it did. After a while I needed to put foil over the breast because it was getting too brown. It did end up delicious, though. We ate a ton of it that first night, and there was plenty for leftovers afterwards. For this I followed a recipe from “How to Cook Everything” by Mark Bittman, which Tasha gave to us as a wedding present. The real name for this is “Pilaf with Wine and Tomatoes” but, well, you’ll see. I cooked the onion in the oil until it got soft, then stirred in the rice to coat it completely. Then I added the wine. I used red because I had some left over from a few nights before. I let it cook down for a couple of minutes , then added the stock and tomatoes (I drained the tomatoes, even though the recipe says you don’t have to). I let it simmer on medium for about 15-20 minutes – check often, because when the liquid is gone the rice should be done, and if you leave it longer you’ll get a crust of burned rice at the bottom of the pot. The flavor was amazing! It tasted quite a bit like wine, which I enjoyed. The only weird thing is that it was completely purple because I used red wine! If you think purple rice will weird you out, use white wine and I’m sure it’ll be just as good. 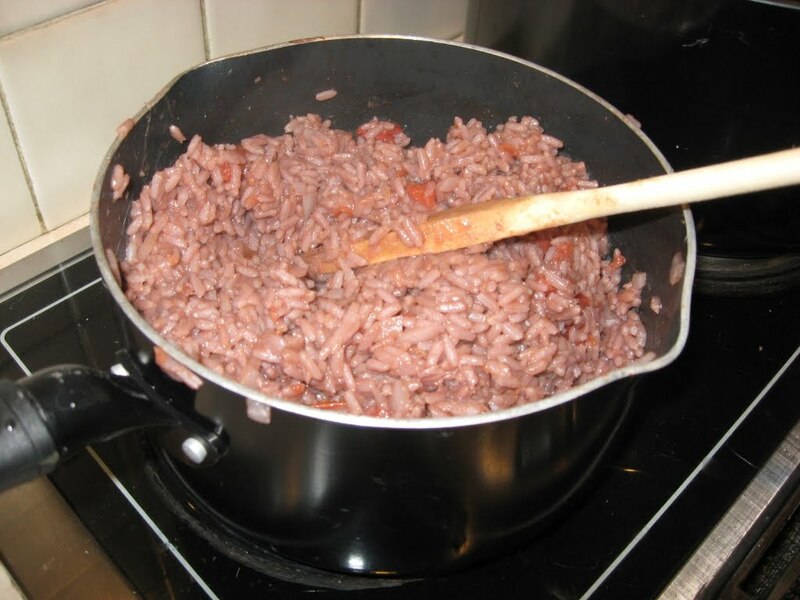 We were completely entertained by eating purple rice, though, so I think I’ll always use red for this recipe. This entry was posted in Uncategorized on October 5, 2010 by antijen.